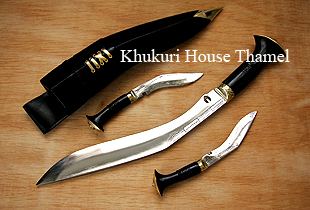 The very famous Khukuri blade "Chitlange" has Mini two Chitlange blades inside its leather scabbard instead of the regular "Karda and Chakmak". This is the newer and nicer version of the Chainpure kukri. The shape of the knife is made like that of chainpure, however with a better touch. The forging of the blade from the tip all the way down to the notch makes this kukri very special, as this is the hardest part of crafting for the skilled craftsman costing more effort and time. Buffalo horn or rose wood handle but with a improved handle is made for better grip. Buffalo leather is used for its case with a new look. If it is a normal Chitlange kukri; leather case is used but if it is a decorated one; rosewood case is used. The hole at the end of the blade is the trademark of Chainpure village. Due to shortages of horn, the handles are now made from India rosewood handles.